Saturday night my friends and I found ourselves in a last-minute predicament of what to do for dinner. We hadn’t all gotten together in months and were hoping to get reservations out but ran into both Easter and NCAA tournament traffic (who knew people liked that stuff so much?). With limited options, we all agreed that it might be best to just order pizza, buy some beers and sit in my backyard. With folks arriving in 30 minutes and expecting at least an hour wait for our pizza delivery, I jumped on my feet to figure out a couple of snacks to hold people over. I scavenged through my refrigerator and found a bag of pita chips, a huge block of feta cheese, an artichoke (I bought it for the party the night before and decided not to prepare it), a lemon and some butter. With some kitchen staples, I was able to put together a quick mediterranean spread without much work. I threw the pita chips in a basket, prepared the artichoke, made a lemon butter dipping sauce and tossed cubes of feta cheese in olive oil, red pepper flakes, very finely diced fresh garlic and dried oregano. 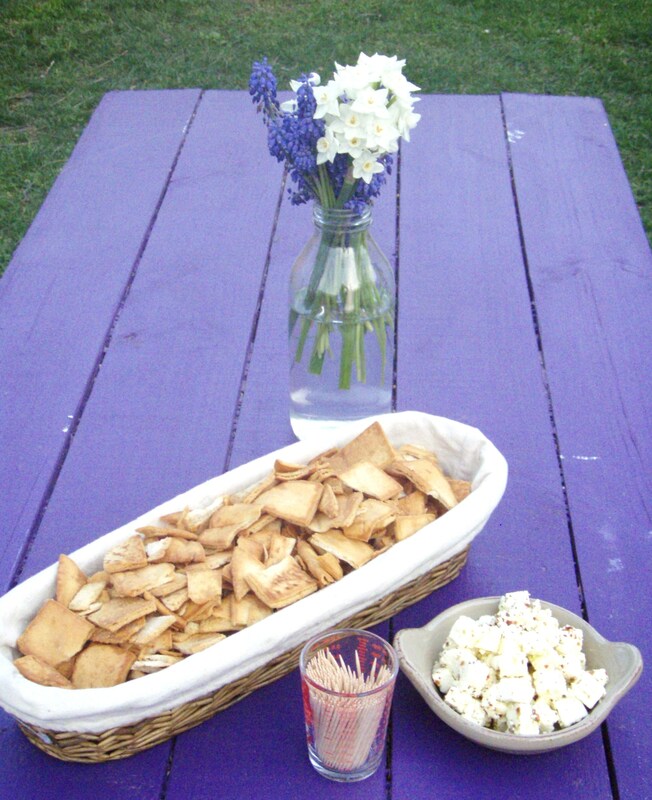 With these snacks displayed on my picnic table in about 25 minutes – I felt like a culinary superstar in my own version of Iron Chef! I highly recommend you try this excercise sometime! Or just keep a couple staples on hand for these sorts of situations! Love the flowers and the photo!!!!!!!! !